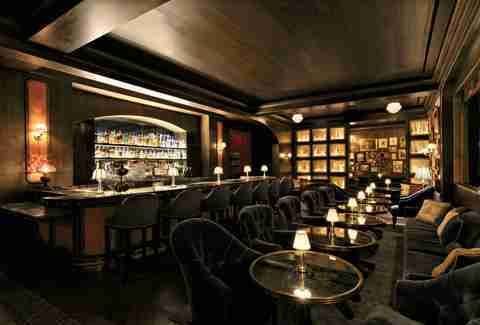 It's always more intriguing to go to a bar known as a "speakeasy," right? Back during Prohibition, lawmakers felt the country would be better off without booze -- and in response, a large chunk of the population said, "Screw that," and kept on drinking anyway. Speakeasies took the place of traditional bars, quickly adapting a low-key approach while operating on the wrong side of the law. Drinks were served with discretion and rules were tight on who was allowed inside. The country has since come to its senses on hooch, and we can openly drink alcohol again. 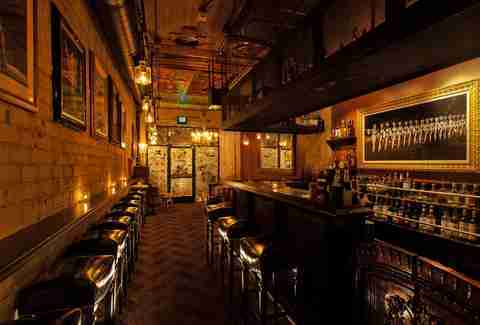 Anything described as a speakeasy these days is really just following the spirit and image of old outlaw watering holes. Some follow a Prohibition theme, some play around with secrecy, and others just focus on an old-school approach to crafting cocktails. Many follow a combination of all three. 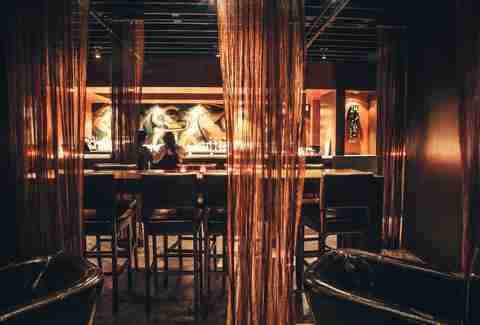 It's no surprise Las Vegas has its fair share of speakeasy-style establishments. Here are the ones most worthy of your attention. Commonwealth is a popular bar in the Fremont East district, but its Laundry Room -- hidden behind the back wall underneath the stairs -- carries the spirit of a true speakeasy. Originally the laundry facility for the historic El Cortez casino across the street, the intimate space accepts guests by reservation only, with a limit of four parties an hour. Browse through the menu for original cocktails -- with cool names like "Old Englishman Comes Home" and "Corsage and Cigarettes After Prom" -- or just talk with the bartender about putting together a customized well-balanced libation based on preferences on flavors, moods, and aromas. No matter what you get, every drink is $16. Mind the house rules. No cell phones. No PDA. No rowdy behavior. Just set the real world aside and get lost in the world of true mixology. 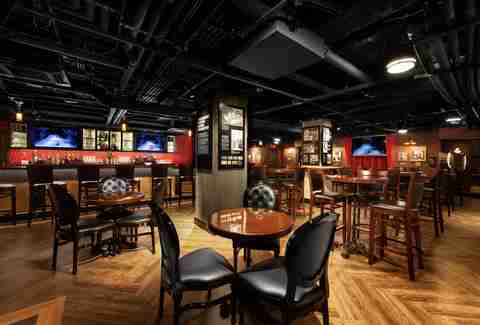 The Mob Museum was already one of the coolest museums in Vegas and a great place to learn about the town's obsession with organized crime, but now it's even better with a fully operational speakeasy in the basement. The Underground is accessible through the museum itself or from a quiet entrance around the corner. Whether the doorman asks for a password or not, you'll get in fine with little trouble. While it feels like a natural continuation of the exhibits on the upper levels, the Underground is the real deal -- and stays open long past museum hours. Hang out in the main room, where live music plays on weekends, or score a seat in the private VIP area, hidden behind a wall and lined with authentic artwork from the Roaring '20s. Most of the drinks are based on recipe books from the Prohibition-era, like a Southside Gin Mojito or an Old Fashioned served on the sly in a glass flask inside a hollowed-out book. An in-house distillery serves up some light-bodied corn-based moonshine, so ask for a shot on the side. 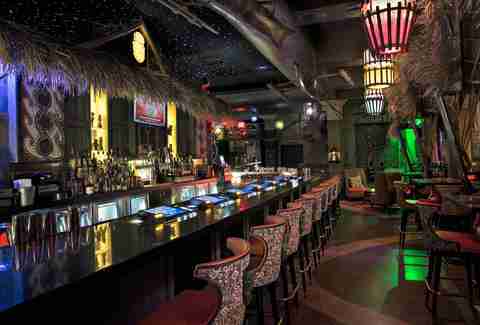 This modern take on a classic tiki bar is dark, mysterious, and full of kitschy decor. Walk in through a lava rock cave, pass by a waterfall, and keep your eyes peeled for a talking skeleton, fully loaded treasure chest, and a conch shell large enough to sit inside. The drinks are dominated by fruity, tropical rum cocktails -- organized on the menu by strength level. Pretty much any of 'em can be turned into a shareable bowl, given a photogenic shot of fire, or topped off with Dole Whip -- a frozen treat originally only served at Disneyland. 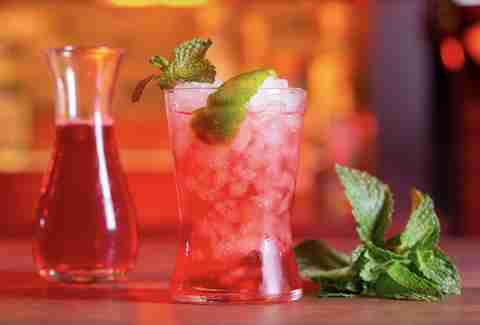 The Golden Tiki is open round the clock and recently brought in Vegas mixologist Adam Rains to mix things up a bit. Capo's plays up its mafia theme from the moment you walk through the door. "Whaddya want?" says a voice behind a small window. Tell 'em, "Thrillist sent you," and see what happens, but chances are good anything you come up with for a password will get you inside. The building used to be a Hooters, but that was years ago. Now, the windows are covered, the lighting is dark, and photos of Al Capone and other classic mob figures line the walls. The music ranges from Frank Sinatra to Frankie Valli. This is old-school, Jersey-style Italian. No messin' around. So, grab a seat in that red leather booth and order the best Italian Beef Sandwich in Vegas or the so-weird-it-works Caesar Salad with pasta and a meatball on top. 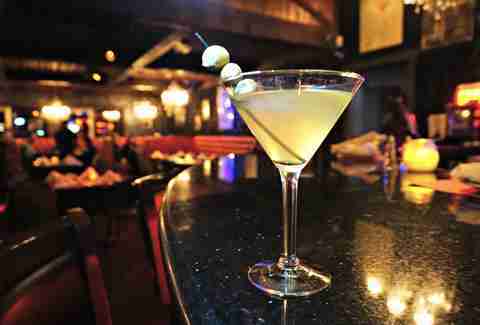 While most speakeasies tend to favor whiskey and bourbon, Capo's is all about martinis. Ask for the off-menu "Sharon Stone" (in honor of the movie Casino), which comes as dirty as it wants to be. The term "craft cocktail" is tossed around a little too freely these days, but few bars take the art of preparing the perfect drink as seriously as Herbs & Rye. The stand-alone building east of the Strip has long been known as an industry clubhouse -- a place where bartenders from other establishments say they like to go on their downtime. 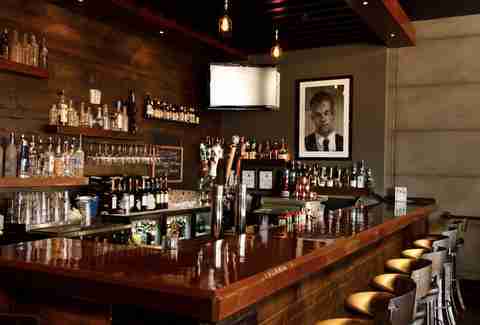 With dark decor and a heavy oak bar top, the place is comfortable but commands attention. The menu itself is a virtual textbook on the history of booze, breaking down cocktails by era -- like Prohibition, Tiki, and Rat Pack. 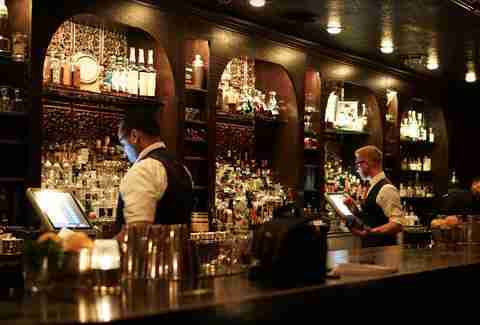 Everything is prepared with care and authenticity, often with spirits not easily found in other bars. The food isn't bad either, and check this out: The steaks are half-off during happy hour. Tucked away in the back corner of the Block 16 food hall is Ghost Donkey, a New York import that seats just a handful of guests and is totally fine with Christmas lights dangling from the ceiling year-round. In true speakeasy style, the exterior of the bar is easy to miss -- identifiable only by a single understated door with a picture of a donkey on it. Agave spirits are the specialty, whether being sipped on their own or in a lineup of wildly inventive cocktails. Mezcal, in particular, is used to full effect in thoughtful recipes that don't conflict with the often smoky flavor of the spirit. As for food, Ghost Donkey does one thing and does it well: nachos. The cheddar black truffle version seems to get most of the attention, but the option with a habanero carrot topping is the real addiction-in-waiting here. Look for the vintage Ford near the escalators at the Shoppes at Mandalay Place. 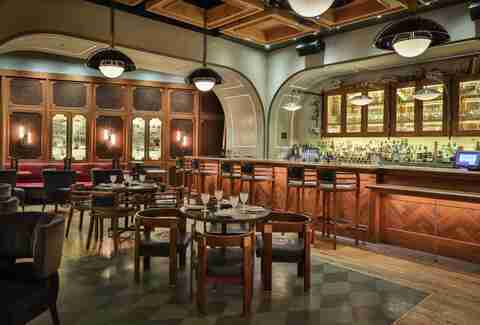 It will lead you to 1923 Bourbon Bar, which plays up its Prohibition-era theme to full effect. It's only open to the public on Fridays and Sundays, and mostly serves as private event space during the week. (Planning a reception after getting hitched? Well, here you go.) The entrance resembles an old liquor cabinet, which slides away to reveal a sleek and modern take on the speakeasy concept. Find a seat near the stage, where the entertainment includes burlesque dancers and the occasional jazz trio. If you prefer some privacy with your barrel-aged Old Fashioned, Negroni, or Manhattan, a smaller room within the venue serves as a cigar lounge. For those who like to sip on spirits nice, easy, and neat, the list was recently expanded to include some Japanese bourbons and limited quantities of Pappy Van Winkle. The Downtown Cocktail Room is the perfect combination of authenticity and ingenuity -- which you don't always see so close to the Fremont Street tourist trap. Established long before the Downtown resurgence, the "DCR" was designed as a word-of-mouth destination with a trick door originally meant to keep the average drunk from stumbling in. (Just look for the glass panel that appears a little different from the rest and push -- don't pull -- to get inside.) The mixology team is always on its toes, revamping the drink lineup with every season. Hundreds of original cocktails have been represented in more than 47 menus over the years. If that wasn't enough, the back room was recently transformed into another bar entirely -- Mike Morey's Sip'nTip -- with its own menu, vibe, and separate entrance from the alley. Take a sharp turn in the back corner of the main dining room at Bavette's Steakhouse, and you'll find yourself in the Parlor Room -- a hidden bar with vintage chandeliers, plush furniture, and a crowded collage of artwork and mirrors on the wall. The drink menu -- heavy on scotch, martinis, and Old Fashioned variations -- is the same as the main dining room, but the atmosphere is loose and cozy. The same can be said for the playlist, which tends to lean toward lounge and chill-friendly hip-hop. The Parlor Room is only open on weekends or busy nights when something big is going on -- like a Golden Knights game at the T-Mobile Arena or a concert at the Park Theater. 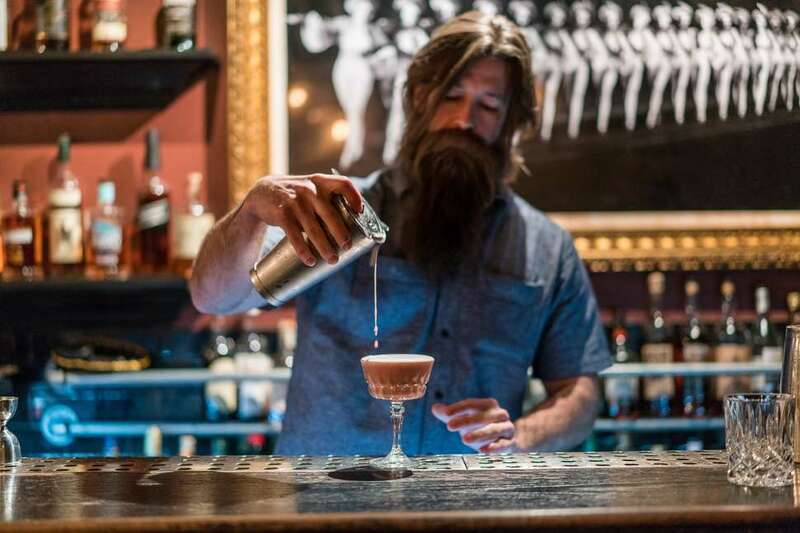 There's a lot of history behind The Dillinger in Boulder City. Built with concrete blocks, the bar and restaurant was actually the original Bank of Nevada, which is why it's now named after bank robbing gangster John Dillinger. There's a heavy focus on beer and burgers, but regulars know to ask about the "secret menu" of cocktails, especially the eponymous Dillinger, made with barrel-aged bourbon, artichoke liqueur, ginger liqueur, sweet vermouth, and a burnt orange peel in a martini glass. The team is also revamping The Spillway -- a discrete bar in the basement of the Boulder Dam Hotel across the street -- by the end of the year. Rose. Rabbit. Lie. 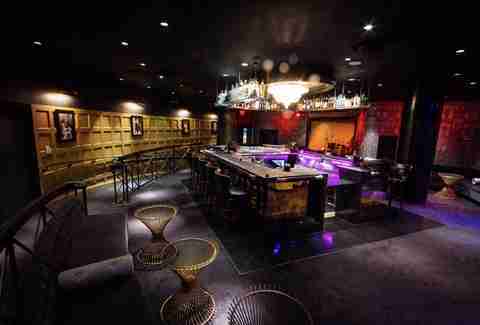 is a stylish super club that also includes The Study, an intimate bar quietly tucked away to the side of the main entrance. Its short menu of internationally inspired cocktails, known as the Study List, will get the night off right when pregaming before dinner. But if you want to stick around a while, feel free to order the same food you'd find in the main dining room. Charming and chill, The Study is lined with bookshelves and has its own record player. Browse through the album collection, which includes a little bit of everything, from Miles Davis to Justin Timberlake, and play DJ in between drink orders. We may be stretching the definition of "speakeasy" with this one, but the Velveteen Rabbit has so much charm and character, it often feels like a venue from a different era. The furniture never seems to match and the walls are decorated with local artwork, but a modern touch is felt with weekend DJ sets on the patio. The lineup of craft cocktails rotates frequently, offering up inventive, well-balanced drinks often prepared with house-made liqueurs and spirit infusions. 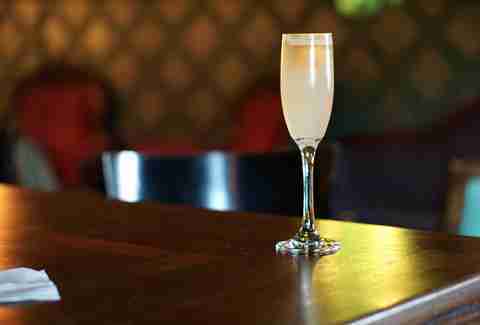 Discrete and quiet, the Velveteen Rabbit has been a staple of the Downtown Arts District for years and, as the neighborhood continues to grow, continues to thrive in the face of new competition. Rob Kachelriess has been writing about Las Vegas for Thrillist for five years. His work has also appeared in Travel + Leisure, Leafly, Supercall, Modern Luxury, and Luxury Estates International's seasonal publication. He's not good at guessing passwords. Follow him on Twitter @rkachelriess.